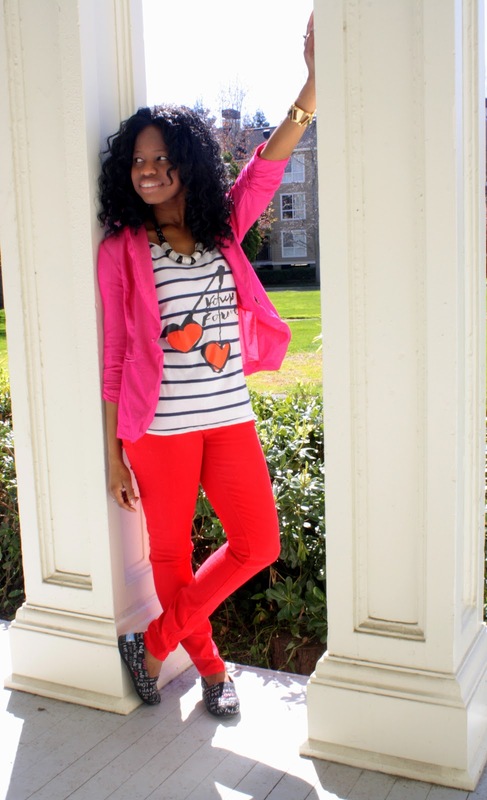 The title of this post is clearly about the red and pink color blocking in this outfit. For a while I've wanted to get my hands on two types of blazers: a brightly colored one, and one that's tuxedo style (still searching for that). This particular blazer is pretty lightweight so it's perfect for the weather we've been having here in California. The 'love' in this title comes from my first pair of Toms shoes. I tweeted about these shoes when I first got them, and I'm still totally in love. They are called the Pink Let Love Rule Vegan Classics. And if you know anything at all about Toms, then you know that these shoes use no animal products and instead use pesticide-free cotton. Also, when you buy a pair, you give a pair to someone in need. 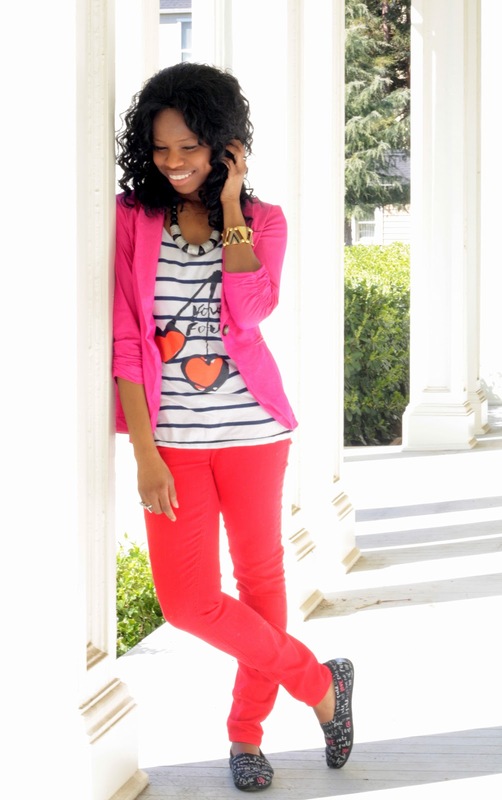 Plus, these shoes go so well with this color blocked outfit, don't you agree? These photos were taken on the porch of this mansion that is near where I live. It's an old, abandoned mansion that is kept up for historical value. I loved the white columns on the porch and thought they would go well as the backdrop for such a colorful look. The accessories are birthday gifts from the hubs. 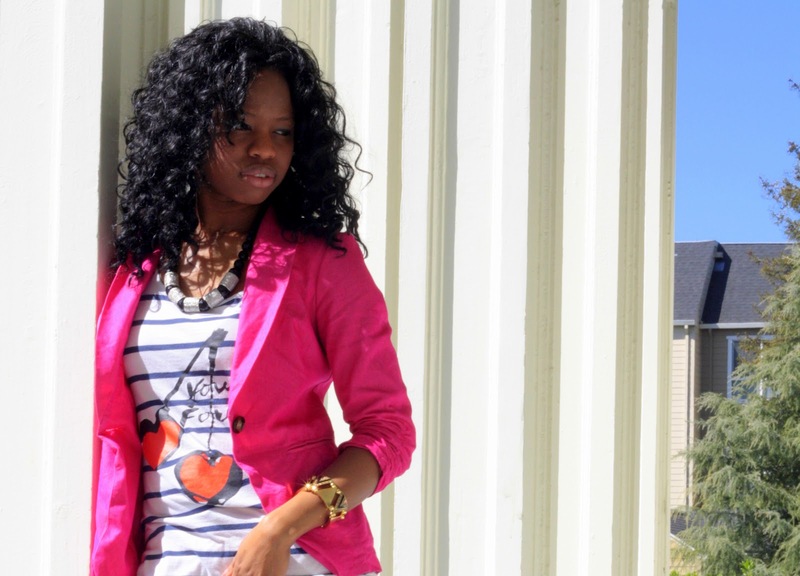 The shirt is old; the pink blazer is from Charlotte Russe (I think). Can't remember where the red pants are from, but the point of the matter is that I finally got my red pants. I've been looking for the perfect pair of red pants since September, so I'm more than stoked about these because they fit like a glove. Another lookbook in March--what do you think? And Sam featured this Mila Kunis for Harper's Bazaar editorial that I totally fell in love with. That girl can do no wrong! I really like this outfit, especially the top! I never think I can pull off color blocking, but it would be fun to at least try sometime. And those TOMS are adorable...I only have the navy blue ones, so I need to step it up and get some with a design! I love this pink and red combo on you! It looks so great and you pull it off so well. love your outfit and love the pictures looking amazing girl !! 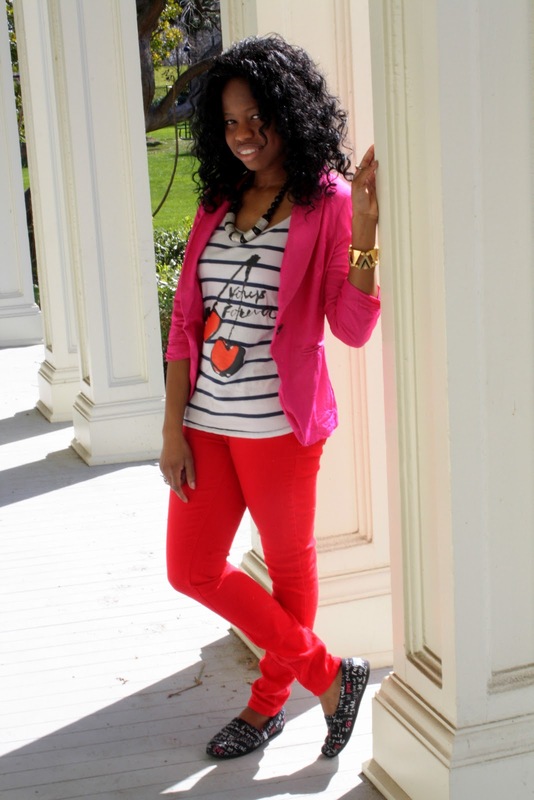 Love those red pants! I am still searching for my perfect pair! I love your outfit, darling! I love the way you've paired the red and pink colorblocking. Your Toms are too cute, btw! OMG I love this look. Love the colors. Love the pictures. You look awesome. Did I already, I love this look>?!?!?! You know that I want to try the pink + red combination too? I like it a lot on you, that blazer is really cool! red and pink is one of my favorite combos...and a very feminine and romantic one, too! 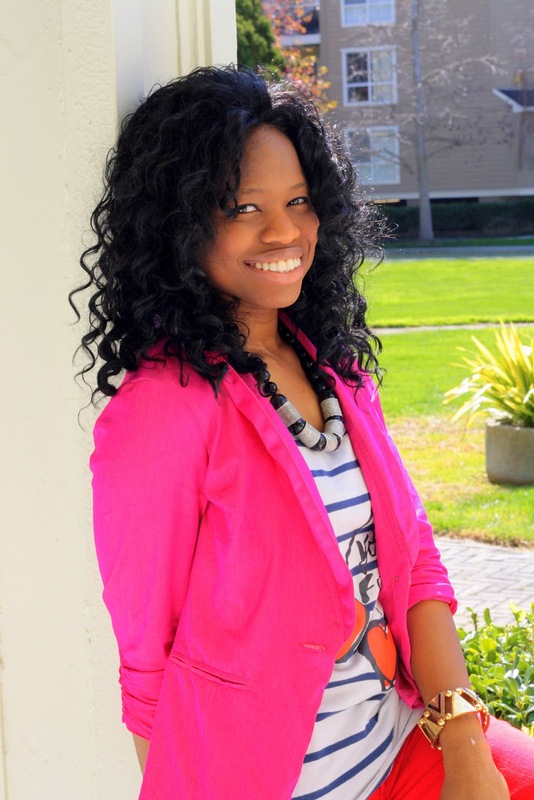 love your pink blazer! I adore pairing "clashing" colors! Your look is soooo cute! And the editorial? RIDICULOUSLY AWESOME! Lovve your look-soo cute! The shoes are a nice touch! && I just got the Bazaar today-Mila is STUNNING! Hi hunny, thanks for showing us how beautifully pink and red can work together. 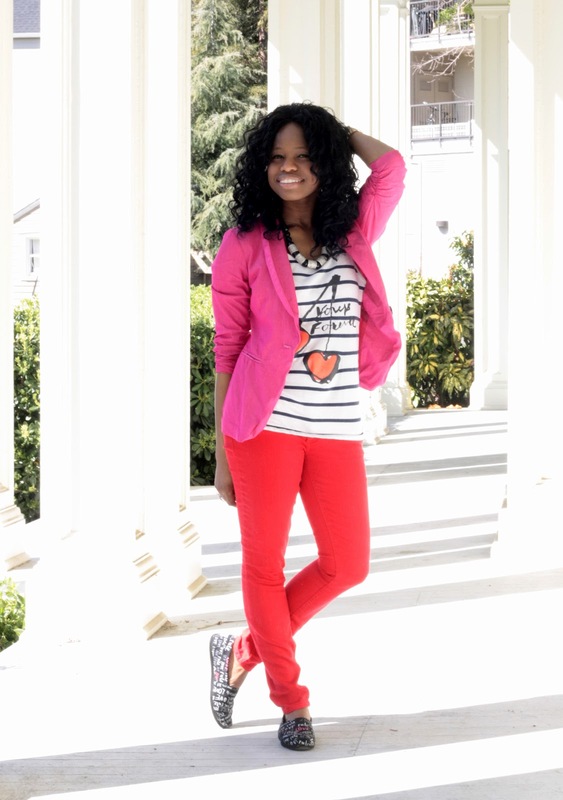 Love your blazer and super cute tee. Awesome and fun outfit! i love when ppl mix pink and red! u look great as always! im also loving the mila kunis editorial. she looks AMAZING! AH! (imagine that as a squeal) I love this T. Those cherry hearts are so cute... and awesome share on the Kunis editorial. Truer words were never spoken. She is totally adorable. Love the outfit! So cute hun. You are so gorgeous, and I absolutely love this combination of red & pink. It's perfection!! The Mila Kunis editorial is stunning - and you look so fabulous! Love the pink & red combo. What a great outfit - not too sweet just sweet enough- love the blazer over the striped top, and the way the red pants and loafers add a casual touch. I can see why you heart it- I heart it too! i think these 2 colours are the best for you!! SUPER cute outfit Cheryl! Love your pink blazer and that shirt is adorable. Definitely a keeper. Sweet of your hubby! He's awesome. Oh gosh, that Mila Kunis editorial was just awesome. LOVE! I'm seriously loving that pink blazer lady! such a cute outfit! love the colors. and you said you styled at that fashion show that was featured on my blog?! that's amazing!!! how did you get the opportunity to do that? Nice outfit and curls suit you.